In this narrative poem Leifr Eirikkson sets sail and arrives at the new-found-land. The poem was inspired by a fragment from the Saga of the Greenlanders and takes place both in a fictive past and in present day Norway and Canada. 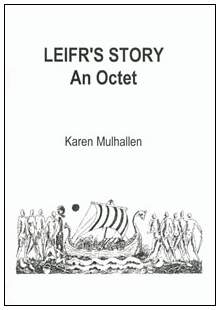 Leifr’s Story, An Octet (8pp. ), a limited edition chapbook, published by Pasdeloup Press in 2002, and illustrated with images after pen and ink drawings by Helen Edmonds. he was the father of the father of my wife. the trees must he ready bent just so. arrowheaded shadows on stark state floor. As I write I can not say how we will end. and yet what is coming is coming as it always has. His depths greater than the well of Democritus. How the old one came leading me to the mountain of Helseggen. whose centre some hold penetrates the globe. then the moon herself full with the lustre of a South-sea pearl. in the innermost depths of darkness. and the sea became again like a mirror.